How does can the media, who plays a critial role in sharing disaster information, preparation and raising awareness to lessen damage from future disasters, best collect and share diaster lessons and records through reporting? How can we think about telling these lessons? Born in 1968 in Akita Prefecture. Gradute of the Law Department of Rikkyo Univeristy. Joined Kahoku Shippo in 1992. After working in the news department, in the Fukushima office, in the? Ogawara office, Tokyo editorial office, and as a reporter in the news department, in 2010 became responsible for collecting information for earthquake disaster prevention and education. Born in 1977, in Hyogo Prefecture. Graduated from Doshisha Univeristy. Joined Kobe Shinbun in 2001, after working at the Itami office, the Hanshin office, the local new desk, in 2010 the disaster news flash section, mainly responsible for earthquake disaster prevetion.? Special Researcher (concurrently) at the Hyogo Earthquake Memorial 21st Centery Institute. 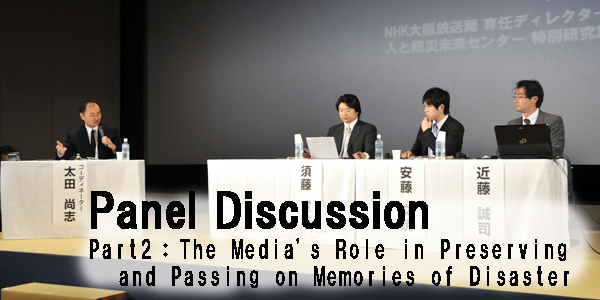 Member of the news department of the NHK Osaka broadcasting office. Concurrently holding a special resarcher position at the Disaster Reduction and Human Damage Renovation Institute. Currently in the post-doctoral course at the Kyoto University Graduate School of Informatics. Has covered the Hanshin Awaji Disaster, Chuetsu Earthquake, Shichuan Earthquake, and Great East Japan Earthquake on site, and has continute with program planning and production. For his planning of a news series, he received "First Prize in Disaster Mitigation Community Building" from the Fire and Disaster Management Agency/Minsitry of Internal Affairs and Communications. For his work on the NHK special "Mega-wide area huge disasters" he was awarded "Prime Ministers Award"for the Science and Technology Video Festival.